Aji Bas Shukriya is a 1958 Indian Bollywood drama film released on 1958. The film is directed by Mohd. Hussien Jr.. This is the simple story of an innocent girl. It can be yours and mine story as well. Because every human being has desire and ambition in his inner soul, and to achieve the goal he puts in his every bit. . Geeta, also for the sake of her prestige parts with the clerical job, much against the wishes of her widow mother. . Fortunately, she happens to meet a Youth Suresh, who employs her in his Theatrical Company. Here she, because of her talent and qualities ascends to the height i.e. she becomes the Heroine. But the shadowing misfortune brings her on the pavement. Inspite of all this she does not loose heart with more enthusism and cooperation of her old neighbour Chandu, she once again resumes her struggle and persevers hard in quest of the mission of her life. . From now on her life takes a turn, she after overcoming a few ups and downs becomes a Film Star. Once again she is let down, inspite of gaining a good name and fame. She looses the confidence and love of her lover Suresh under some misunderstandings; who leaves her alone. . The damsel, who could burn others with the flames of her beauty; now in herself buries the very flames. . But till When ? . This is a secret and which will be revealed to you. Thanks. Check out this page for more updates on Aji Bas Shukriya. 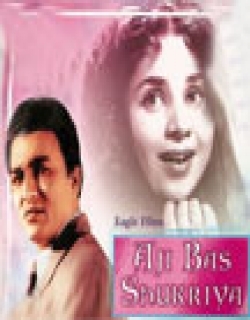 This page provides latest and updated information about Aji Bas Shukriya (1958) movie which released on 1958. Aji Bas Shukriya (1958) is directed by , produced by , starring .We have also provided 0 trailers and videos, 2 photos, 0 user reviews, and 0 critic reviews.You can review, like, dislike this movie and also can add to favorites. You can also find information on showtimes, CDs, DVDs, online rental, online free watching.